Japan in the 16th Century was a harsh and brutal land. Warlords, large and petty alike, ravaged villages and countryside in ruthless grabs for revenge and power. Can you make a difference and unite the clans? You’ve just as much a chance to set things differently with this quick, lightly-themed card game as you do traveling back in time. So assemble your ashigaru. Sharpen your katanas. Even enlist the help of Richard Chamberlain. You’ll need them all to be the greatest Shogun under the sun. 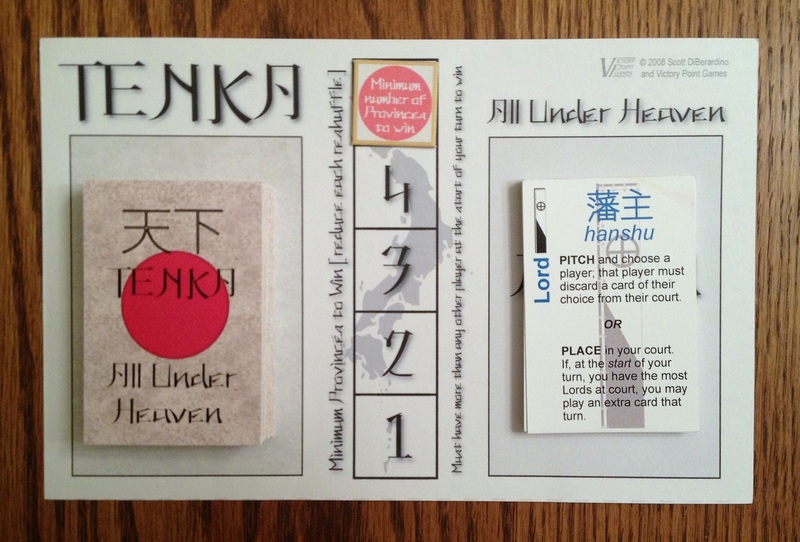 Tenka: All Under Heaven is a tableau-building card game with some sharp interaction and a set-collecting aspect. You will play cards in a variety of ways for certain benefits to collect (and protect) a target number of Province cards to unify the divisive nation. To begin, each player is dealt eight cards. Everyone secretly chooses three to lay down in their tableau (called courts) and keeps the remaining five as their starting hand. The courts are then revealed and play commences. The deck includes four different suits – Provinces, Lords, Priests, and Knights – plus twenty unique, specialty cards. On your turn, you first draw one card from the deck and add it to your hand. Then you can play a card in one of three ways. You may either pitch (discard) it for a one-time action. You may place it to your court in hopes of future benefits. Or you may discard it as payment for the cost of initiating battle. You also have the option to simply pass, but since that is self-explanatory, not to mention boring, I’ll move on to pitching, placing, and fighting. The draw deck, province victory track, and discard pile. Each suit grants a different ability for either pitching or placing. The cards clearly explain these powers. Some of the specialty cards also have either a pitch or place effect, though many of them might only allow one or the other. Again, the card text provides details. The interesting crux to many of these diverse abilities is that they allow you to shake up the game’s simple structure of “draw one, play one.” For example, pitching a Priest lets you take a random card from an opponent. However, if you add it to your court and are able to achieve a majority in that suit, you are able to draw two cards at the beginning of your turn. Collecting the most Lords by placing them in your court allows you to play an extra card on your turn, while pitching it forces an enemy to discard one element from his court. 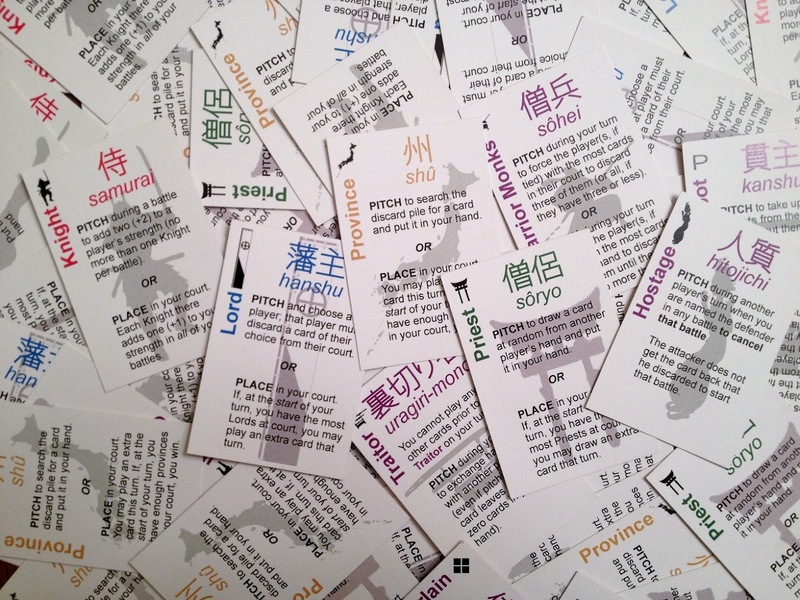 You need five Provinces in your tableau to win (that target is reduced by one each time the draw deck is emptied and reshuffled), but if you’d like a particular card from the discard pile, you may pitch one to retrieve the desired item. Interestingly, playing a Province to your court also allows you to play another card immediately. Anyway, aside from the fact of knowing whether or not your opponent has a Knight to pitch, these mêlées seem fairly straight-forward affairs for accountants, not warriors. There are two twists, though. One, after the attacker has declared whether or not he will pitch a knight, then other players are given an opportunity to pitch a Knight of their own for either combatant. After them, the defender pitches last, if desired, so that he will know what odds are against him. Allies may join the fight without risking loss – other than the Knight they just pitched. If the attacker wins, he’ll earn a card as spoils or conquer a Province, while the defender will be forced to discard a number of cards based on the magnitude of defeat. If the defender is victorious, there are no spoils involved, but the attacker must discard casualties. Ties are anti-climatic, as nothing really happens. That is at least for the generals warm and cozy back at the geisha houses. Tell that to the bloodied and broken grunts in the field. Thankfully, the look of Japanese playing cards improved from feudal times to modern Pokémon! Should Your Sun Rise on this Empire? Is it just me, or don’t you think that a preponderance of ancient illustrations depict emperors, shoguns, samurai, and daimyos with shinning heads, exceedingly receding hairlines, or thinning ponytails? Maybe that’s simply because they were old men and, well, that happens to us guys. Or perhaps, as in any culture, it was just the strange style of the times? (I mean, we Americans still have some explaining to do for the mullet.) However, after playing Tenka: All Under Heaven, I now realize these powerful leaders and generals went bald from the stress or from pulling out their hair in frustration. If this game is any indication, the life of a Medieval Japanese lord was definitely no walk in the Zen garden. Okay, so maybe this quick, little card game doesn’t really model the life of a warring clan leader during Japan’s Sengoku period. But it does generate a fair amount of inner angst and player interaction. The battles often amount to mere addition, especially later in the game when players have a better understanding of their opponents’ cards. Including a random element would make combat more dynamic – or maybe even allowing players to pitch more than one Knight per fight. However, the metagame of bluffing and wits creates melodrama, nonetheless, as you never know when those capable might rush into the fray. The beauty in this unassuming design is its core simplicity and quickness. An occasional game will run over a half hour (usually only with 4 players), but most fall well within the timeframe. This brevity creates tense and unforgiving play that can really reward the fortunate and quick-thinking, while punishing the unlucky and clumsy. The bold or cautious can wind up on either side of the spectrum, depending on the draw. Time is short and, armed with that knowledge, you will anxiously maneuver and struggle in an effort to stack your court quickly and gain an early advantage. The specialty cards can provide a significant boost to your endeavors. However, some are significantly more powerful than others. Plus, you only use half of them in a game, which helps to minimize the chaos and generate replayability, but decreases the chances of acquiring one at an optimal time to exploit its uniqueness. They’re fun and interesting to use, but it’s all quite random. The abilities from those pitched are extremely nice to have if acquired early on, while the ones requiring placement in your court can be lost easily until you’re able to protect them. The theme is attractive. I mean, who doesn’t like Medieval Japan, samurai, katanas, and Tom Cruise. Well, maybe that last bit about Cruise isn’t historical. But suffice it to say, the Unification era in Japan is a fascinating period of historical study. Alas, Tenka: All Under Heaven does not capture that feel. That is not necessarily a major critique. Card games rarely burst with theme due to their limited nature in components, artwork, and mechanics. Other than providing generic names and actions, the Shogunate has little connection with game play. Instead, feudal Japan is a film placed upon the mechanics. But further disconnect with the subject comes in the bland cards with no artwork and little flavor. Victory Point is famous for their emphasis on mechanics and game play in order to keep costs low and focus on quantity of titles as opposed to quality of aesthetics. However, this is the polybag, first edition. Victory Point is planning to release a Gold Banner, second edition (available in a box, even) with much improved artwork and a bit of pizzazz. From the teasers, I’m confident that the spruced up version will prove more enticing and engaging, even though it still may not “transport you back in time,” so to speak. New card artwork from Victory Point web site. FANTASTIC! One issue that Tenka moderately suffers from is that of a dominant strategy. Your early aims will be to acquire and place Priests, and then subsequently Lords. As owning a majority of Priests allows you to draw two cards per turn, you are both augmenting your choices and stuffing your hand with expendable losses should you be an early target. These extra cards increase your chances of collecting Lords, a majority of which then gives you extra plays. With those two majorities, you are now routinely drawing and playing twice as many cards as everyone else. The rest of your needs will soon fall into place. This early focus does not break the game, by any means, but may diminish its staying power. On the bright side, two things somewhat alleviate this tendency. First, just because you may aim for the Priest/Lord stratagem doesn’t mean that luck of the draw will accommodate you. Second, in 3- and 4-player games, your opponents can unite against you in temporary alliances to preserve a fragile balance of power. In fact, I would argue that they must collaborate in order to stop you. But the runaway leader problem renders the 2-player game joyless. You can still use a bit of strategy, but luck of the initial deal is far more influential than in 3- and 4-player games. If you have a bad hand against a foe of equal skill, there’s really little you can do. Sure, it’s always possible an individual will bungle away a decent beginning. But even then, the game’s little fun. Essentially, the winner of a 2-player match will be a foregone conclusion within a few minutes. As soon as one is able to use their opening salvo to achieve the upper hand in cards and plays, 90% of the game is going through the anti-climatic motions. 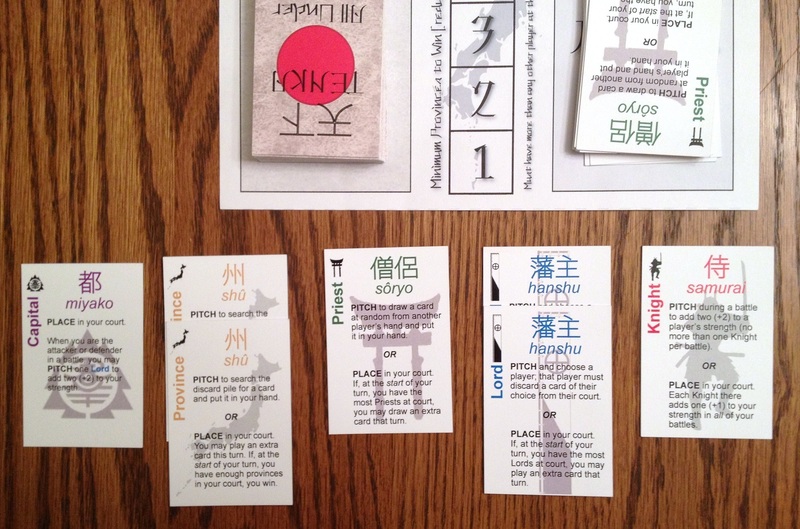 Tenka: All Under Heaven is a smart design, easily understood and simple to play. It moves along briskly with very little downtime from turn to turn. For such a straight-forward card game, it generates a surprising amount of anguishing decisions as you search for optimal cards to play at the right time – but must do so quickly. Mercilessly unforgiving, deliciously interactive, and highly random, Tenka offers a showdown affair best for 3 or 4 people who can roll with unpredictability and/or really enjoy card games. It may not be attractive or immerse you in the world of bushido, but holding out for the Gold Banner edition may help. Either that, or pop in a Kurosawa film while you play – he’s got you covered. 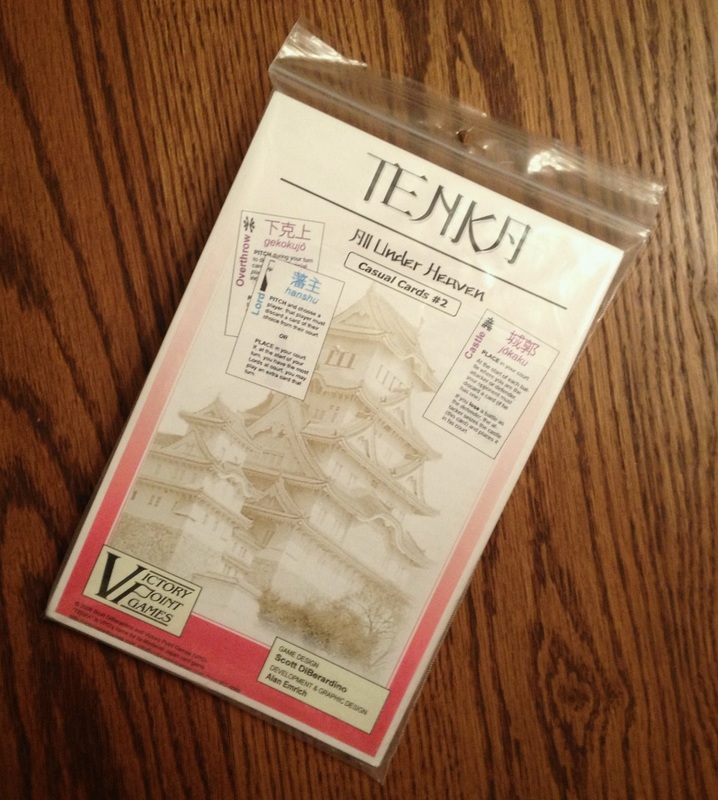 iSlaytheDragon would like to thank Victory Point Games for providing a review copy of Tenka: All Under Heaven.